2010 Olympic Mascots from Hell! It was a very big day up here in Vancouver, host city to the 2010 Winter Olympics, for today was the day our esteemed Olympic organizers announced the official Mascots! That's right, just like every Wal-mart has its greeters, every Olympics have their Mascots. For the 1988 Winter Olympics in Calgary it was the unforgettable "Hidy" and "Howdy", cowboy hat wearing polar bears that were conveniently mass produced into cuddly little stuffed toys for all the delegates to expense and bring home to their children. Sheer marketing brilliance! 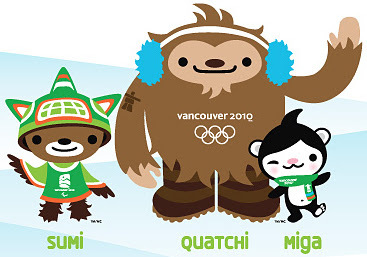 Not to be outdone by our fellow Canadian Olympic city to the east, the 2010 Winter Olympics in Vancouver will have not one, not two, but three official mascots…and a marmot friend named Muk-Muk. Each of the critters has a "west coast" feel. Miga the "sea bear" is a combination of an orca whale and the Kermode spirit bear. (What the...?!?) Quatchi's a sasquatch and Sumi is a mythical thunderbird spirit who loves to snowboard. Their side-kick is a marmot named Muk-Muk (thankfully not pictured here). I can't say I've ever been more embarrassed to be a Vancouverite. Those "things" are absolutely horrific and we are so PC it's ridiculous. By trying to include every possible ethnic and spiritual group represented in BC we have created characters that are so ugly they will frighten small children! But maybe it's not too late. Maybe we can quickly rescind those abhorrent characters and replace them with a single, all encompassing mascot that not only represents every PC cause we can think of, but also provides ample cuteness for the obligatory stuffed toy market. Let's scrap Miga, Quatchi, Sumi, (the damn Marmot, too), and produce a character that makes us all proud! and most importantly we should stuff a joint in it's mouth to represent the true spirit of West Coast winter sports! Now wouldn't that be much more applicable and child friendly? And finally, maybe we could name our little beast something like, oh I don't know, how about Dave?